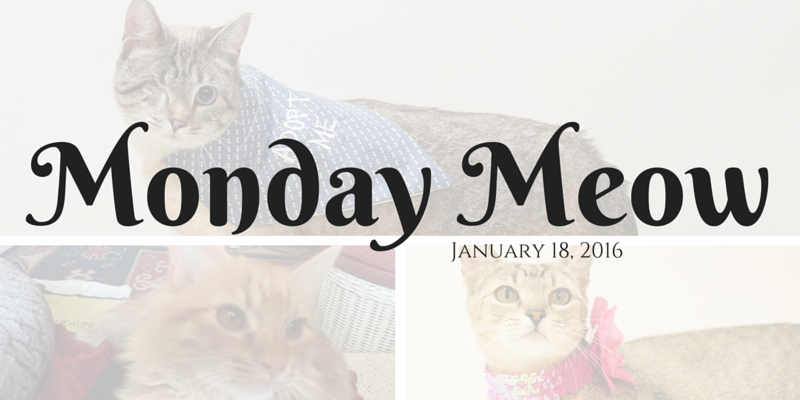 This week’s Monday Meow features cats of all ages, shapes, and colors playing with toys… and cheap ones at that! Sierra has such a great foster family and they are constantly introducing her to new toys to play with. In this short video you can see Sierra trying out 4 new toys. If you have a cat, give some of these toys a try and let us know how your cat takes to them! As part of her daily exercise and mental stimulation, Janna is seen here in this short clip playing with a battery-operated mouse. She even picks it up and takes it into her little cat cave. Most of her exercise plan requires a bit more activity on her part, so we’re hoping to see her shed a few of those extra pounds over the next few weeks and months! Simba is new to our organization and his temporary foster bought him this toy to help him settle in. It may have only been $5 but he has been playing with it for hours! Simba is about 5 months old and just as sweet as he looks. Thanks for tuning into our weekly Monday Meow! Be sure to share with your family and friends, our cats and our cat volunteers thank you.